Here's March's Book of the Month! You are a Badass by Jen Sincero. I stumbled upon this gem on a "you might also like" list in my audible account. After reading a few reviews, I decided to check it out and let me tell you, I'm glad I did. I loved this book after just the first couple of chapters and as I read through to the end, it definitely didn't disappoint. What I love about this book is Jen Sincero's "real world" way of explaining personal development. She speaks in a no-nonsense language that's easy to understand and relate to. Now as a disclaimer, there is some "colorful" language in this book so if you're easily offended or have a hard time with expletives, then you may want to find something else to read this month (and I'll be more than happy to help you find something if you like). 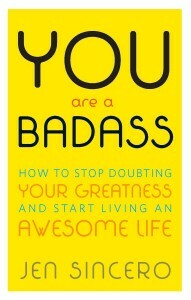 So grab your copy of You are a Badass and unleash your inner badass to the world!! !